★Stainless Steel: The 3 items are both made from stainless steel for lasting durability. Beautiful silver tone. Sturdy for long time usage. ★Perfect Kitchen Assistant: Great cooker set, considerate kitchen tools. Help you cook fine and delicate dinner. Fall in love with cooking. [Stainless Steel]: The 3 items are both made from stainless steel for lasting durability. [Saw-Tooth Head]: Scales are removed by saw-tooth head with less effort and mess, while leaving flesh intact.The item could remove the kernel of the fruit as well. Also job-well-done in pineapple. [Delicate Knife and Grater]: Sharp knife is easy to take fruit apart. Fine grated holes could grate carrot, cheese, potato and so on. 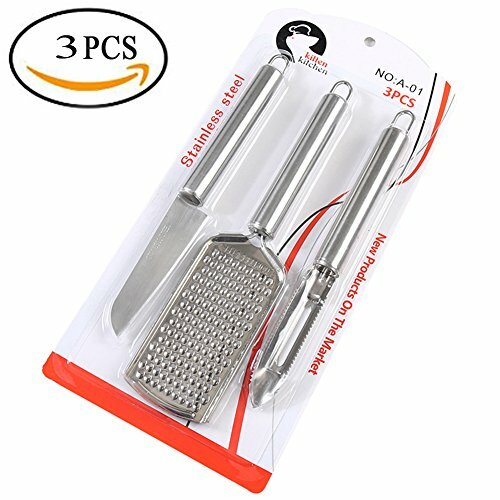 [Scraper Handle Design]: Ergonomic easy handle design provides firm grip, remove fish scale, kernel, cut down fruit without efforts, excellent kitchen assistant. [Save Space]: A hanging hole allows to hang the scale remover easily, and save space.